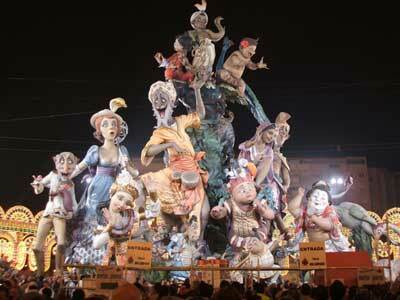 Falla Nou Campanar is the biggest spectacle of the Fallas of Valencia. 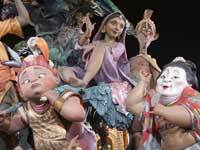 This falla won the first prize for the last three consecutive years (including 2006 when they created the biggest Falla in history). Not central, but do make the journey - the falla is worth it. 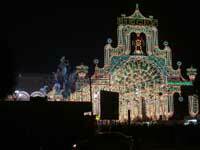 The falla of Nou Campanar embodies the commercialisation of the Fallas of Valencia. It has only been in existence for 4 years. 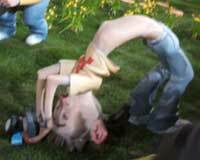 Many of the traditional Falla-Communities view it as the doom of the real spirit of the Fallas, pure a-la-New-York bigger and better commerce, a surrender to the tourists. In the end of the day, it is all about the amount of money at the disposal of Nou Campanar. 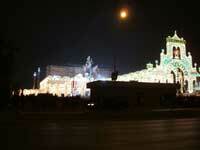 Nou Campanar has elminated the fair fight spirit of the Fallas. 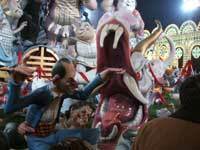 Before it's existence, various Fallas Especiales would win the first prize, in a close tie competition. Now it's going to be Nou Campanar every year, pretty much forever. 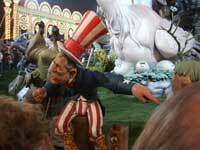 In 2006 the theme for the falla was the Oriental invasion. In the last few years Valencia experienced a large influx of oriental immigrants who captured markets and restaurant industry with novelty and cheap prices. Prime minister Zapatero opening up an oriental brothel.